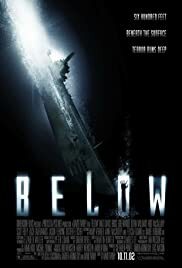 Strange happenings occur on a WW II submarine. Lt. Loomis: This is almost a day behind us, sir. 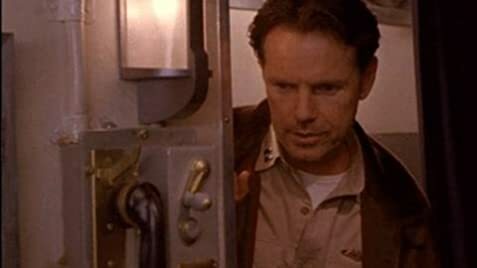 Lt. Loomis: Well who are they? Americans, Brits, Italians? It doesn't even say. Brice: Well I think we can assume they're friendly, Mr. Loomis. Besides, it doesn't appear to be a suggestion, does it. Q: Is Below based on an actual vessel and/or series of events? Periodically I go through fits where I'm convinced that the American public is losing the capacity for thought in entertainment; that 99% of the movie-going public has reached the point where every smallest nuance must be telegraphed as loudly and as blatantly as possible, and any intelligent content must be simplified so it's comprehensible to the lowest common denominator. Below is not like that. This is a movie that simultaneously gives one hope (that something this stylish and subtle could be made in 2002), and despair (that the studio has shown so little faith in it that they've cast it adrift without any advertising or backing). Why this hasn't received even one quarter of the attention of Ghost Ship I can't fathom--if you have a choice, go see Below instead. If you like beautifully photographed, well-thought-out eerie psychological horror films that don't tie everything up in a nice pretty package of explanations in the final shots, and are willing to give the relatively unknown but excellent cast a shot, then by all means hunt this one down. 97 of 117 people found this review helpful. Was this review helpful to you?